CBL has worked with the Wilder Foundation for many years. Projects have included individual housing units, main corridors, gathering rooms and employee offices. Housing Manager Jane Bicker wanted the lobby to be an area that made a great impression on visitors but to also be multi-functional for the residents. The area is used for a number of different occasions. It’s where residents have coffee in the morning, have their weekly group gatherings, hold birthday parties and chat with visitors and friends. Wilder needed a hard surface that was durable, easy to maintain and beautiful. It was also important to find a floor that had a little texture for slip resistance for the seniors. The area around the hard surface was to be re-carpeted to create a “home living room” feel rather than a cold commercial environment. Design and Product Selection: CBL designers showed Wilder a variety of flooring combinations of soft and hard surfaces so that the Wilder staff could choose the look and feel that was right for their residents. With the help of the design team, they selected a luxury vinyl tile that was just the right fit for their needs: it offered easy maintenance, durability and a tailored look that gave it a “homey” feel. The Wilder staff approved a border of a different color tile, which added a nice finishing touch. 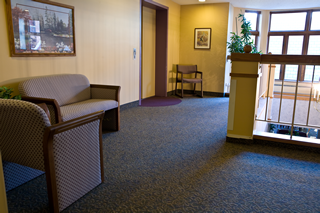 A patterned carpet transformed the lobby into a welcoming living room and with Everset (an advanced soil treatment) on the carpet fibers, this area would also be easy to clean and maintain. Installation: This job required precise scheduling. 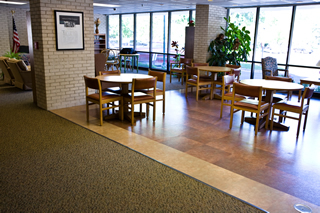 Because of the elderly residents, it also required an elevated attention to creating flawlessly smooth transitions from carpet to tile as well as maintenance of clean and safe working areas during the install.